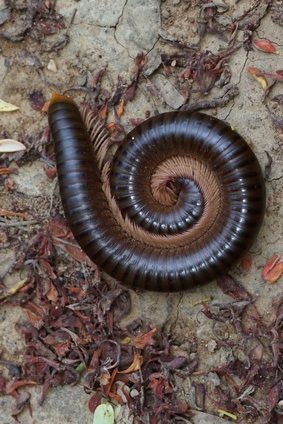 Anyone who’s ever lifted up a rock or piece of wood from a wet knows that they’re likely to find little, tightly coiled millipedes underneath. Millipedes are arthropods and make their homes in dark, damp places. Because of the resemblance to centipedes, some people approach these animals with trepidation, not knowing if they’re poisonous or capable of biting. Millipedes are in the Diplopoda class, making them closer related to crustaceans than insects. They typically live around 7 years, and their gentle nature makes great pets for those who like the non-furry variety. They’re non-threatening detrivores, or consumers of dead and decaying plant matter; this explains why they’re attracted to rotting wood and leaves. Females prefer making nests in soil to lay their eggs, and will use their own feces to create a protective cocoon. Once it’s created, they’ll deposit anywhere from 100 to 300 eggs, which will hatch in about one month. Millipedes hatch with only 6 body segments and 3 pairs of legs, which is hard to imagine! They grow more with each segment they molt into, and grow to have about 25-189 segments, not including the head and tail segments. With 2 pairs per segment, millipedes can have anywhere between 50 and 378 legs. While that’s not 1000 like their name implicate, it’s still an impressive amount. Male millipedes are known to “date” females by giving them a relaxing back massage with its many legs. Talk about being docile gentlemen! While they don’t mind moist places, too much moisture is enough to drive them out of their nests and into your homes, so during the raining season is when you’ll see them more. While millipedes are calm creatures, they do have ways of protecting themselves and even fighting back if necessary. Millipedes will make themselves tight coils to protect their bellies as a primary defense, but they are capable of emitting a foul smelling and tasting chemical from their stink glands. This chemical is capable of blistering human skin, but is only used as a last ditch effort with only certain kinds of millipedes. It’s best to exercise caution and wash your hands after handling them.